*Katharina Frei* - Kreatives Sammelsurium: Hoch sollst du leben! 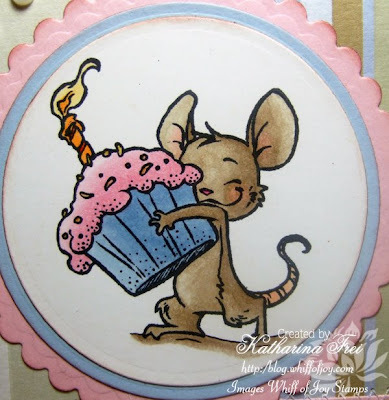 I used Henry the celebrating mouse designed by Alison Acton for Whiff of Joy Stamps for my little birthday card. I cut him with my round petite Nestabilities from Spellbinders and layered him with bashful blue and pirouette pink cardstock from Stampin' Up. The pink paper is embossed with the argyle embossing folder from Cuttlebug. Ich habe Henry die Partymaus designed von Alison Acton für Whiff of Joy Stamps für meine kleine Geburtstagskarte verwendet. Ich habe ihn mit den round petite Nestabilities from Spellbinders ausgestanzt und mit blauem und rosa cardstock von Stampin' Up hinterlegt. 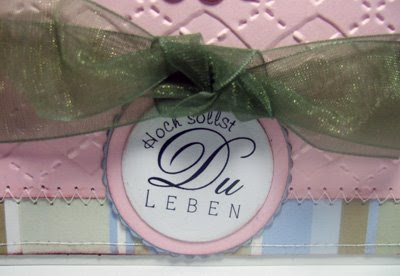 Der rosa Papierstreifen ist mit dem argyle embossing folder von Cuttlebug geprägt. The sentiment is from the WoJ german birthday and party sayings collection and means "It's your day!" Der Text ist von der deutschen Party und Geburtstagskollektion von WoJ. I coloured Henry with Copic Sketch Markers. The below picture shows which colours I used. Ich habe Henry mit Copic Sketch Markern coloriert. Das untere Foto zeig twelche Farben ich verwendet habe. Thanks for stopping by :) and don't forget to check out the Cute Card Thursday blog. Danke, dass ihr bei mir reingeschaut habt :) und vergeßt nicht auf dem Cute Card Thursday blog vorbeizuschaun. Love that little mouse. SO cute! What a pretty card Katharina!! Oh how sweet is he and so beautifully coloured! really cute stamp and pretty colored!! Ich finde die Maus für Geburtstagskarten ideal, sie ist soooo knuffig. Dann noch so schön coloriert, toll! Gorgeous..love the pink and of course your wonderful colouring! Gorgeous card! Fabulous colouring, as always. Ich mag das Rosa sowieso, also trifft die bei mir voll ins Schwarze *gggg*. Deine dicke Schleife finde ich klasse!!! This little mouse is at the top of my wish list!! He is so adorable and your card is really pretty. Love the embossing. Just perfect!! Hi Katharina, I just love this stamp and you have colored him perfectly! Your images on your cards always seem to pop and just come to life! This one is so cute! I have this image and used it many times! He is simply adorable!! You've done outstanding with the coloring on him!! How sweet is this creation!! :) Love those Copics! Sooo cute, love the look of the copis. Katharina what a beautiful Henry you have made! Very cute! Love that little guy!! So cute, very nicely colored as well!! This is an adorable card! I love your coloring with copics...very natural looking! wunderschöne Farben! Einfach tolle Karte! Danke für den tolle Anleitung wie einen Text am PC generierst. 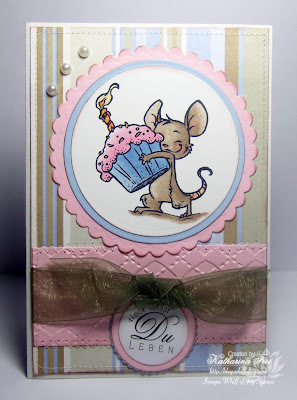 Gorgeous card, I love that little mouse. Die Karte ist absolut süß geworden. So schön frühlingshafte Farben! Aorable Katharina! That embossing adds the perfect touch. Have a great weekend! Gorgeous! I love the expression on this little mouse's face!